1 What happens if you run out of money? Money matters - especially when you don't have enough, either in the early game or when you're conquering the galaxy. The game software decides which items to scrap in order to raise cash and maintenance costs, and it's seldom what you would have considered the least painful thing to scrap. Your citizens (but not Androids or Natives) pay tax into your Treasury, and that's the bulk of your income. Non-Lithovores usually have a slight food surplus, and Lithovores may have one if they have colonies with Natives; surpluses are automatically sold at the end of each turn, for 1 BC per 2 units of food. A very few colonies provide "special incomes": 5 BC per turn from gold deposits or 10 BC per turn from gem deposits, irrespective of the population (which must be at least one at any colony). Unfortunately many of these are guarded by Space Monsters, and the rest are likely to be fought over by empires that are within range. Various racial/empire traits can increase your income from these sources - or decrease them if you chose -0.5 BC. Maintenance costs of buildings, especially early in the game when you'd like have Automated Factories at even the smallest colonies. Population growth usually cures that problem by increasing the number of taxpayers. That's one of the reasons why growing your population is so important. Moving colonists around in the early game to speed up your population growth. You need to manage this carefully until your population grows to a size where the number of colonists in transit is a small percentage of the total. Spies' salaries, in the early game. This is another problem which diminishes as population growth increases your income. Having a fleet that requires more command points (CP) than your empire generates, which costs 10 BC for each CP of the deficit. This problem is most likely to arise when you move from defense to attack. Since it's fairly complex and the answer involves military strategy as well as good economic management, it's best to deal with it in the military parts of this guide. The need to build up as quickly as possible colonies that you have invaded, which generally involves buying quite a lot of buildings. This will also be dealt with in the military part of this guide. Also a little help for the new colonies with their Automated Factories, Robo Miner Plant and other production-oriented buildings, especially once they are half built and only cost 2 BC per production unit. But in order to have the problems of mounting an effective attack you first have to manage your finances so that you can afford the industrial and research buildings you will need in order to produce an effective fleet, and that's what the rest of this page is about. You have to do this in the early stages, because at that time you don't have the production and research capacity to increase your income quickly. Generally the least painful way to reduce costs is to avoid unnecessary costs. In a medium or larger galaxy there's no need to build warships at all before about turn 40, because would-be blitzers are too far away to strike quickly. But stockpile production from then on so that you can quickly produce either stationary defenses or a small defensive fleet if necessary. Toxic planets cannot be improved in any way and only Subterranean or Tolerant races will be able to build large populations there - and feeding these colonists will be a burden if they are not Lithovores. Most other races should avoid them unless they offer very clear advantages, either because they have gold / gem deposits (extra income) or they are Rich or Ultra-rich and may be good places at which to build ships. In that case, it's usually best to avoid building much there in the early game and just use them as Population 1 Housing colonies. The same is true for Radiated planets and, to a lesser extent, Barren planets, because terraforming them up to good population capacities is so expensive. Don't buy buildings if your reserves are static or falling. From a financial point of view it's best to develop one planet at a time in the early game and use the rest as "baby factories"; this minimizes maintenance costs and maximizes the number of people whose productivity is enhanced by the buildings you produce and who are paying taxes. Don't produce defensive buildings earlier than necessary, but stockpile production where possible so that you can produce defenses quickly if needed. The Races (diplomacy) Screen's Report option shows how many Spies another empire has deployed against yours (in this example the row of icons just above the "hand" cursor on the left). Spies can be a very dangerous weapon in the early game, as some races with espionage, financial or production advantages will use espionage or sabotage to weaken you long before they attack — think of Spies as a weapon with unlimited range. It's prudent to stockpile production and then produce 4 spies immediately you make contact with another empire. Unfortunately Spies cost 1 BC each per turn in maintenance, but that burden is less serious than having technologies stolen or buildings sabotaged. Produce 4 Spies quickly the first time you make contact with another empire. Over the next few turns use the Races screen to check how many Spies the other Empire has deployed against you, and what spying bonuses the other empire has, and produce more Spies to stay ahead — especially if your government is Democracy, which is weak in defensive spying. Watch out for end-of-turn messages like "A defending spy was mysteriously assassinated" or "X stole technology Y from you" and produce 2 more Spies every time you see such a message. You'll need to move people from "baby factories" to where you need extra population, so you just have to bear this cost. At the very beginning the only way to raise extra money is to turn production or food into cash, at 1 BC per 2 units of production or food (but you get nothing for 1 PP + 1 food). Raising taxes is seldom a good idea because it reduces effective production at all your colonies and thus reduces the rate at which your "baby factories" produce population and the rate at which growing colonies develop. It's better to produce Trade Goods than to raise taxes because you can choose which colonies bear this burden - preferably colonies that have a reasonable amount of stockpiled production so that they can build new buildings quickly — especially income boosters such as Spaceports. Non-Lithovores will usually have a small food surplus, which will produce a small income - usually only 1-3 BC per turn in the early game. Lithovores will only have a food surplus if they colonize planets with Natives; but then it's usually 6-10 food per planet with Natives, which yields 3-5 BC. It's seldom worthwhile to increase food production to raise money: even on a Terran planet an early-game farmer produces only 2 food (worth 1 BC), while an industrial worker produces 3 units (worth 1.5 BC as Trade Goods) even without an Automated Factory. But if you have to produce Trade Goods at such a high rate that you have large losses due to pollution: (a) you've really messed up your economy; (b) try producing some Trade Goods elsewhere, or try producing surplus food, and see which produces the larger income. On the very first turn Unification and Democracy governments often scrap the Marine Barracks on their homeworlds to reduce maintenance and raise 30 BC to help buy things (usually Colony Bases or Automated Factories) - these governments suffer no morale penalty for not having a Barracks. 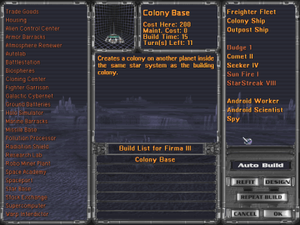 Some players even think a Unification empire should scrap the homeworld's Starbase for the same reasons; the big disadvantage of that is that you can't use a Battleship as a production stockpile until you re-build the Starbase, because the largest warships that planets without Starbases build are Colony Ships, which cost only 500 PP, less than the 1000 PP or higher cost of a battleship. Spaceport (400 RP; 80 PP; maintenance 1 BC) increases income from taxes by 50% (does not work with income from gold deposits, gem deposits, surplus food or Trade Goods (global tax rate works the same way as trading goods, except it does not convert all production into income). Stock Exchange (1150 RP; 150 PP; maintenance 2 BC) adds 100%. Several Stock Exchanges on colonies with large populations will usually banish money worries. Yes, the happier your people are, the more taxes they pay — they must be working overtime. The biggest effect on your game is going to be the morale penalty imposed on all Dictatorship and Feudalism colonies, so ensure these colonies have Armor Barracks (400 RP; 150 PP; maintenance 2 BC) or Marine Barracks (60 PP; maintenance 1 BC), which raise morale by 20% (from -20% (80%) to neutral (100%)) to curb this. As far as boosting morale, your options are the Holo Simulator (900 RP; 120 PP; maintenance 1 BC; raises morale by 20%), the Pleasure Dome (6000 RP; 250 PP; maintenance 3 BC; raises morale by 30%), and the Virtual Reality Network (4500 PP; achievement; raises your morale by 20% at every colony). The first thing you'll notice here is that these buildings all typically pay for themselves immediately. The Holo Simulator's maintenance is paid for at 5 population, and the Pleasure Dome at 15, which means that every population unit past that is producing extra money for you. That's a fairly nice bonus; a Holo Simulator and Pleasure Dome add up, effectively, to another Spaceport, which can be a real booster for a money-centric racial build on top of being a major step up for your industry as well! And, of course, the extra PPs due to the morale bonus can translate into extra Trade Goods (i.e. BCs) as well. Morale boosters are usually of most benefit to Creative empires. 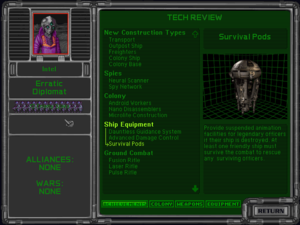 For non-Creatives, the alternatives to Holo Simulator are Supercomputer (research booster; the most common choice) and Positronic Computer (the first decent combat computer); and non-Creatives usually forgo Pleasure Dome in order to get Molecular Computer (the best combat computer) or Achilles Targeting Unit (a real killer warship system that makes enemy ships' armor ineffective); and alternative to Virtual Reality Network is Galactic Cybernet (research booster). Unification governments never get morale boosters. Buildings that boost income have maintenance costs. There's no point in building Spaceports and Stock Exchanges where they lose money, as making money is their only function. You may want to build morale boosters in loss-making locations for other reasons. The extra income from a Spaceport or Stock exchange depends only on the colony's population. On a normal planet, a Spaceport needs at least 4 people for it to make a profit and so does a Stock Exchange. On Toxic, Radiated and Desert planets, both need at least 5 people in order to make a profit, because maintenance costs are higher on these planets. This page was last edited on 3 November 2018, at 13:56.